This series picks up in January 2009. OUT OF RETIREMENT – Life has been good to the former Dino Thunder rangers. Which means that the other shoe has to drop. PG-13; Conner/Kira, Tommy/Kim, Hayley/Billy. FAMILY LINES – The Dino Thunder team gets the scoop on why Nova’s come looking for help and a few bombshells get dropped as well. PG-13; Conner/Kira, Tommy/Kim, Hayley/Billy. MAKING A PLAN – With the Dino Thunder team is still reeling from the surprise that Beth is a ranger; they have to deal with strategizing a rescue of Beth’s fellow SPD rangers. PG-13; Conner/Kira, Tommy/Kim, Hayley/Billy. 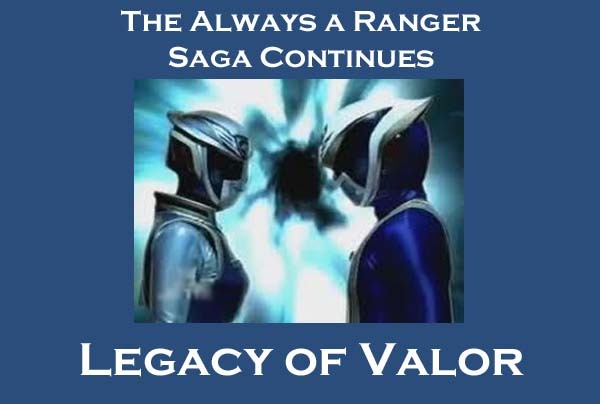 ONCE MORE INTO THE BREACH – Their plan in place, Nova, Omega and the Dino Thunder team attempt their rescue of SPD. PG-13; Conner/Kira, Tommy/Kim, Hayley/Billy. WRONG SIDE OF THE DOOR – The rescued SPD team clashes with Tommy and the Dino Thunder team when Kim and Beth get left behind enemy lines. PG-13; Conner/Kira, Tommy/Kim, Sky/Syd. TORTUROUS BONDING – Kim and Beth are captured and while they wait for rescue things go from bad to worse. PG-13; Conner/Kira, Tommy/Kim, Sky/Syd. MAKING ANOTHER PLAN – Time is running out for Kim and Beth, so old friends are called for help. PG-13; Conner/Kira, Tommy/Kim, Sky/Syd. THE BEST OFFENSE... – A rescue is on... but will it be with a bang or without a hitch? PG-13; Conner/Kira, Tommy/Kim, Sky/Syd. COVERT AFFAIRS – Jack and Z take on the acting job of their lives. PG-13; Conner/Kira, Tommy/Kim, Sky/Syd. ROCK AND A HARD PLACE – Kim and Beth are out, while Tommy, Z and Jack need to get out before the battle can begin. PG-13; Conner/Kira, Tommy/Kim, Sky/Syd. NOTHING STAYS THE SAME – With the SPD saved, it’s time for goodbyes. PG-13; Conner/Kira, Tommy/Kim, Sky/Syd.